Whatever their differences, the Sanders and Trump insurgencies sharply reject the dominant trend of a generation. An amazing thing happened on the way to the 2016 election. The primary season confounded one of the fondest wishes of neoliberalism: to abolish the need for collective solutions to collective problems. Two huge anti-mainstream insurgencies—the one, Donald Trump’s, captured the Republican nomination, and the other, behind Bernie Sanders, came tantalizingly close to snatching the Democratic nomination from Hillary Clinton—have been demanding active government intervention to address America’s social pain. Whatever their profound differences, both sharply reject the dominant trend of a generation. This article is adapted from We: Reviving Social Hope (University of Chicago Press). Some of the material appeared earlier as "The New Politics of Hope" in The Boston Review. We have, over these years, been pushed and pulled towards an individualist dystopia in which, according to its proponents, it would be unnecessary (and unthinkable) for governments to do more than the most minimal tasks. A social and political transformation has been taking place that includes reshaping realities as well as attitudes. The new arrangements have many names: neoliberalism, austerity, privatization of government services, free-market globalization. It has led to numerous practical changes including charter schools, “the end of welfare as we know it,” prisons for profit, warfare using mercenaries, deregulation of banking, NAFTA, the Trans-Pacific Partnership, the growth of the “precariat.” Even breakthrough government programs such as prescription-drug coverage and the Affordable Care Act have been designed to be carried out by corporations and built on private profit and individual responsibility. Although we are getting used to these changes, their bizarre character can be captured by an odd-sounding expression: What has been taking place over the past generation is the desocialization of social pain. These changes have been implementing Margaret Thatcher’s mission “to change the soul” of the underlying population. She had in mind making people less dependent, less prone to look to unions and to government to solve their problems, and thus more willing to assume responsibility for their lives. This was, of course, in keeping with her main contention that “There is no such thing as society. There are only individuals and families.” Right-wing think tanks and media have been drumming this into anyone who will listen for a generation, reshaping values, ideas, and attitudes in an immensely effective, well-organized, and lavishly funded effort. They have implored us to turn away from treating the public realm as a terrain for improvement and change. They have pitched, as the dominant value of American society, that each of us is on our own. Even in our individualist society, this goes sharply against a core belief: that our individual well-being is tied in with the well-being of the society, and that collective well-being is an essential goal that we can and should pursue. Thus it was not outlandish that President Lyndon Johnson should declare a “War on Poverty” in 1965, or even that a majority of Americans believed that poverty could be eliminated in their lifetimes. Thus urban renewal, Model Cities, Head Start, unemployment benefits, manpower training, and dozens of other forms of social responsibility. But more recently we have been living within what I call the privatization of hope, when such collective projects have lost support. We have rather been trending towards an “individualized society,” or a “risk society,” or even a “second modernity,” as discussed by social theorists starting with Anthony Giddens, Zigmunt Bauman, and Ulrich Beck. The new society demands, according to Beck, that individuals are charged to find “biographic solutions for systemic contradictions,” i.e., the society demands that each of us become responsible for developing personal paths for negotiating the society’s shortcomings. Ideally, then, we are all on our own. This fable was decisively upended in 2016, as people turned out by the tens of thousands, and voted by the millions, against neoliberalism’s plans for all of us. Rejecting the atomizing trend from both ends of the spectrum, they have been responding to the social pain of our troubled times: the Great Recession and the neoliberal projects of austerity and privatization, rising inequality, student debt resulting from the decline of social funding for education, the loss of well-paying manufacturing employment due to globalization, and declining working-class incomes and social power. 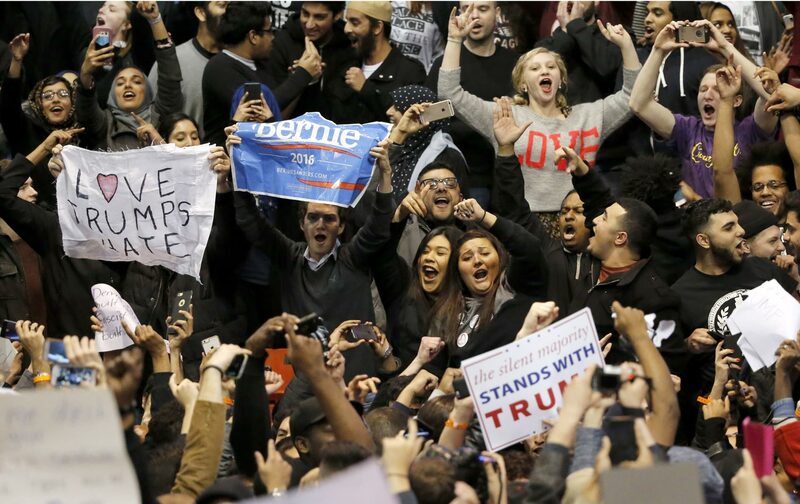 These sources of the Sanders and Trump movements are widely understood. What is not well recognized is the same abrupt turn at the heart of both campaigns: the rejection of the individualized society, its smugness, and the experience of living in the free-market maelstrom shaping people’s lives. Never has there been an electoral rebellion like this. Without saying so explicitly, the Sanders and Trump campaigns rejected the privatization of hope, making neoliberals in both parties aghast, Sanders for his lack of “realism,” Trump for his lack of “conservative principles.” Without Sanders or Trump’s saying as much, the common secret of the two insurgencies is the reassertion of social belonging. Thatcher was wrong: The soul could not be changed; society cannot be dissolved into its individuals. The 2016 primary season demonstrated that, whether or not they say it in as many words, significant numbers of social individuals will continue to resist their conversion into atoms, and will demand political solutions for political problems. Whether they will do so confusedly or clearly, as a mob or as a movement, destructively or constructively, the repressed has returned. Obviously, there are enormous differences between the two movements, including the different social locations of their participants and the fact that the Trump campaign is more of an authoritarian cult of personality than a social movement, while Sanders hearkens back to the universalism of past socialist movements. But unlike the likely next president, Hillary Clinton, whether in covert racist terms or social-democratic terms, both are expressing that conditions have become intolerable. A rebellion is afoot: Social pain will no longer be displaced onto individuals. Will electing Hillary put the genie back in the bottle and resume the forward march of neoliberalism? And if so, will 2016’s visceral shift from individual to social responsibility become no more than a momentary blip? Much of the crisis, as well as the individualization and desocialization, developed under Bill Clinton and Barack Obama, so are we fated at best to continue the Democratic Party version of neoliberalism, with its slight ameliorations and gestures of concern for those who have been passed by. If so, will the tumult, left and right, generated by near-majorities on both sides during the primary season, die down as globalization continues on its way? Making the most of the rebellion of 2016 requires overcoming a certain diffidence within the Bernie campaign. Bernie’s supporters, so strong in their specific demands, must begin articulating their general principles. Sanders never explicitly spelled out the vision of social belonging, of democratic participation and collective responsibility, laying behind his many specific programmatic demands. Against Hillary’s Democratic Party neoliberalism it can be said that we are all in it together and need to come up with collective solutions that are fair and just for everyone. What is it that ties breaking up the big banks with free college education with a living wage with blocking free trade with universal government-provided health care with restoring Glass-Seagall with reversing Citizens United? Say it! We should argue for the underlying premises inspiring every one of Bernie’s specific proposals. We should contrast it with Hillary as well as Trump and the Republicans. Something new is happening, among us, in the larger society, and one of our tasks should be to formulate and fight for its collective vision. Ronald AronsonRonald Aronson is author of We: Reviving Social Hope (University of Chicago Press).